When it comes to finding the right ice cream maker, you have many choices to look at. In fact, the number of options can be a little overwhelming. While you might think of restaurants and ice cream parlors as the main customers for these appliances, the truth is that there are dozens of homemade ice cream makers to choose from and they can range from as low as $50 or even less up to several hundred dollars for a new model. One of the best ways to begin your search is to find the companies with the best reputation for making ice cream makers for the home and comparing prices and ratings of each. 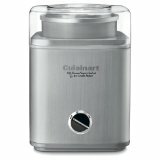 The Cuisinart ice cream maker line is renowned for making homemade ice cream, sorbet, and frozen yogurt all from one machine. Their average line ranges from $50 for a very basic Cuisinart ice cream machine and yogurt maker all the way up to $300 for the advertised commercial quality homemade ice cream maker. Depending on which machine is being used and what treat is being made; time can range from a light 20 minutes to a still extremely reasonable time frame of one hour for enjoying frozen treats. The average warranty for Cuisinart ice cream makers vary from 2 years to 3 years depending on the machine. One of the major benefits of looking at a Rival ice cream maker is that there are so many inexpensive models, ranging from $25 to $50. Many of the designs produced by Rival are not fancy or “commercial grade,” but they are simple, easy to use, and get the job done 1 to 6 quarts at a time. As with their Cuisinart competitors, the users manuals are available for download online. The Rivals homemade ice cream makers might look simple with an outside blue bucket and the mechanics located within, but they make delicious ice cream and have a strong reputation among happy consumers. Krups International enjoyed a strong reputation for making high quality ice cream makers, so much so that you can still find people searching for these appliances online despite the fact that Krups discontinued these appliances back in 2007!� A Krups ice cream maker even included a little LCD screen to keep track of the progress and let the user know when the ice cream was actually ready, eliminating the guess work. These included feeder bowls to add ingredients during the process, and it was a little bit of a surprise when the Krups homemade ice cream makers were discontinued. These are some of the major names out there for homemade ice cream makers, and while they differ widely from one another, all of them have earned a reputation among consumers as companies who create a quality ice cream maker.